Your arrival at Kokomo Island Fiji is just a spectacular as the resort itself. After your 45 minute flight from Nadi or 25 minute flight from Suva, you arrive in the stunning Kadavu Island group, just south of Fiji's main island. Your holiday waits. 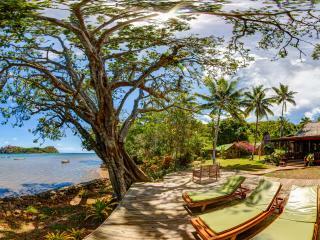 Here at Kokomo Island Fiji, guests enjoy the luxury that comes with a 5 star all-inclusive resort. And all this is nestled on a picture perfect island surrounded by golden beaches and a pristine and tranquil lagoon. 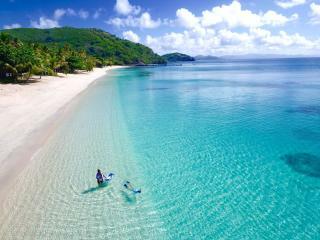 Matava - Fiji... Untouched is located on Fiji's fourth largest island of Kadavu. Kadavu is located approximately 100 kilometres south of the main island of Viti Levu and is one of the few remaining undeveloped islands in Fiji today. Kadavu is renowned for it's world class diving and the resort of Matava - Fiji... Untouched is only minutes away from the Great Astrolabe Reef, home to an abundance of marine life unequalled in Fiji. Divers and snorkellers can expect a diversity of fish life and corals of every conceivable colour and hue.